Approach | Sales and development of processed starch Maker Nippon Starch Chemical Co.,Ltd. Approach｜ We are developing and producing processed starch with the function suitable for the application by taking advantage of the properties of the natural starch. Starch is one of the most widely distributed material in nature. It is contained in most plants and formed in the leaves and green parts of plants through the assimilation with the help of enzymes from energy of the sun, water and carbon dioxide. Starch is stored in seeds of rice, wheat and corn, in tubers of potato, sweet potato and tapioca. It is known that these starches are high polymer materials in linear and/or branched polymer of a few hundreds to some ten thousands of glucose units. It consists of amylose and amylopectin. Starches extracted from seeds and tubers are white and fine powdery materials and the size and shape of particles vary depending on the sort of starch and the ratio of amylose and amylopectin is also varied. Adding water to starch, it is not soluble but precipitates. It swells up to some tens of times or more by heating and then gelatinized with viscosity. If it is left as is, it starts to cloud and turns to gel. Main ingredients of modified starch are potato starch, corn starch, tapioca starch and so forth. These raw starches are processed to modified starches making best use of each characteristic. potato starch, corn starch, wheat starch, tapioca starch, sweet potato starch and rice starch. They are fine powders consisted of linear chain amylose and branched chain amylopectin in range of a few microns to 10s microns. Depending upon the raw material, it varies in the size of particle and shape and resulting to show different characteristics. As starch is not soluble in water, it can easily extracts in water from the storage in plant. Its suspension starts to become viscous by heating and turns to transparent paste. 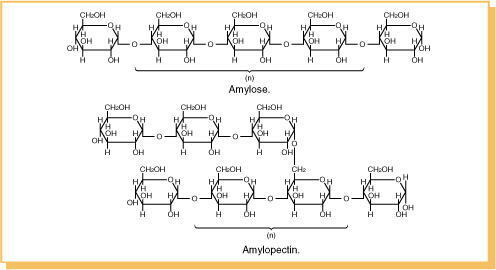 It means amylopectin forms crystallized micelle and amylose arranges orderly around the gaps of the micelles in starch particle. This is why starch is not soluble in cold water. However, water molecules are getting into micelles gradually when heating the solution and resulting to loosen hydrogen bond and short molecules of amylose starts to dissolve, then amylopectin swells up. Starch is swelling up by heating and continues to swell up absorbing water and showing more viscosity and clarity along with increase of temperature and then will reach to maximum viscosity. By giving further higher temperatures, the outer shell of starch particle which have highest crystallinity index starts to collapse and amylopectin and amylose inside outer shell are melting out and its viscosity is getting lower by heating and stirring. 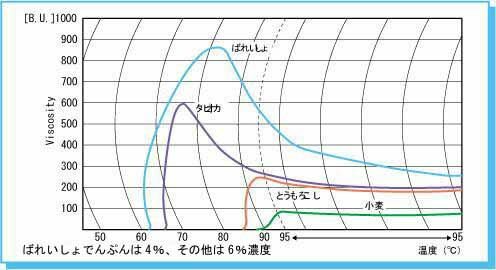 Viscosity is gradually increasing again when the solution is chilled down and continuous chilling makes the solution cloud and less clarity. Leaving to stand the solution, it shows more white and in case of higher concentration of starch, it gels and in case of low concentration, syneresis and precipitation will be caused. This is the retrogradation of starch caused by recrystallization of amylose through cooling. The solution of starch which is gelatinized by high temperatures shows high viscosity and non-Newtonian flow. This indicates the decrease of apparent viscosity when the shearing stress is faster and this is considered an interaction of swollen starch particles. Thixotropic viscosity of potato starch, which has thread forming property is termed“long”and plastic flow viscosity such as cornstarch, which has less thread forming property is termed“short”.